Montbell’s motto is “Function Is Beauty,” and I love their products for being simple and lightweight yet functional and well-crafted. I’ve worn Montbell jackets on all of my thru-hikes, so I was eager to try out their Thermawrap Trail skirt and see how it performed on the trail. 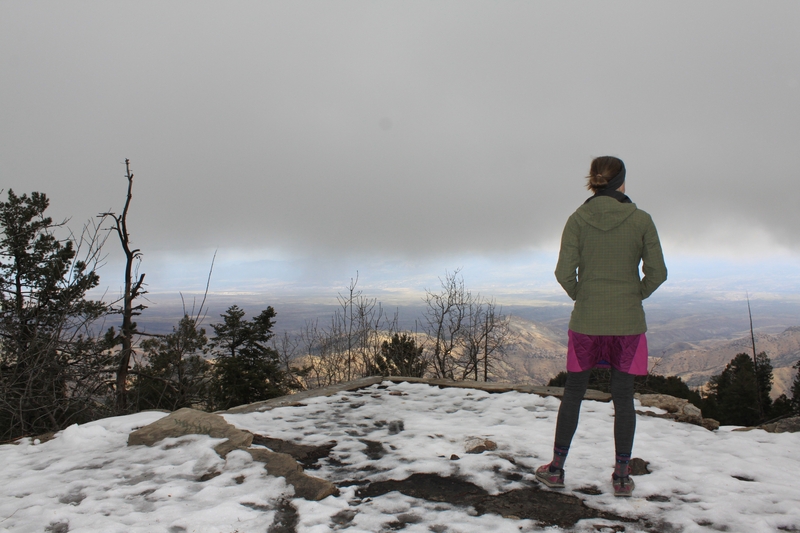 I took this skirt out in adverse weather as much as possible in the desert Southwest. 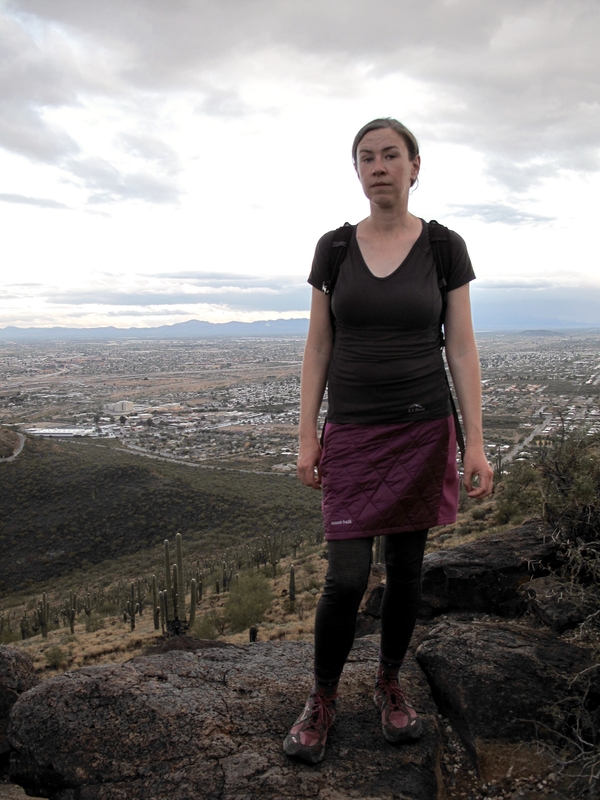 From various hikes in the mountains along the Arizona Trail to urban hikes in Tucson, this skirt hiked in rain, mist and cold gusting winds, through snow, and a little sunshine. This skirt is super comfortable! With a stretchy elastic waistband and similar stretchy sides, the skirt fits easily and moves well. 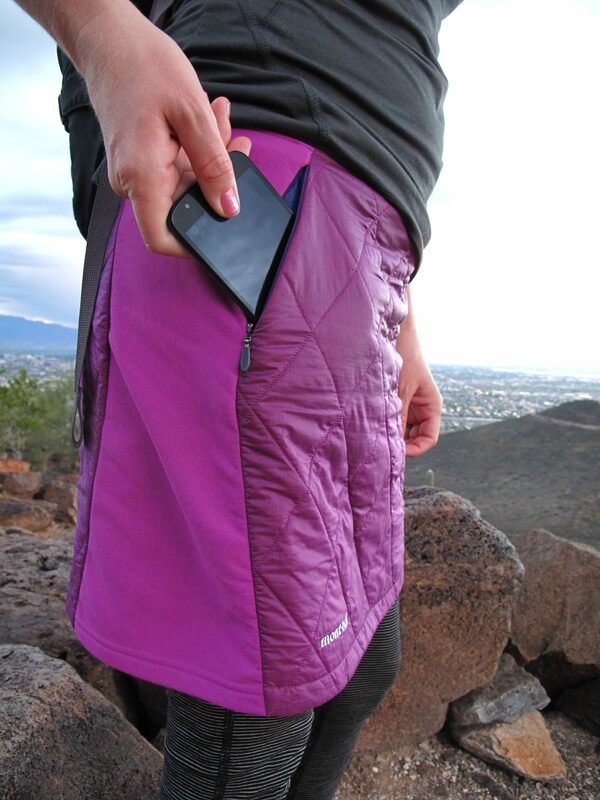 No drawstrings or buttons to worry about, no zippers to break, and the skirt stays in place while hiking. I especially appreciate that there are no seams digging into my hips, and I think anyone wearing a hip belt would agree. Plus, the insulation really does add warmth, which was especially noticeable in cold winds. 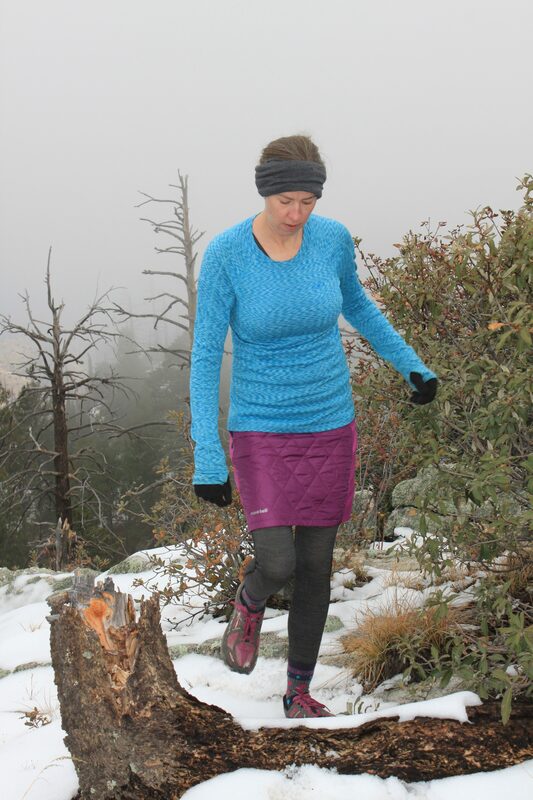 I paired this skirt with a pair of midweight thermal leggings for hiking in cold weather (in the 30s F) and once temps were up over 50 F I was comfortable without leggings. The zippered side pocket is great: it’s big enough to securely hold a phone, keys, and a small wallet. While hiking in the rain, the pocket kept my phone dry, though I’d still keep it in a ziplock on a thru-hike. Hiking skirts offer several advantages over pants, but some people just like them for the extra style. This might be less important to a thru-hiker, but when I hike in or near urban areas, I notice most hikers seem fashion conscious. I also noticed my skirt got a lot of second glances from people hiking in boring old yoga pants. I’m being nitpicky here, but so much women’s gear comes in either teal or magenta, I get pretty tired of these colors. However, you can get this skirt in black or a light minty green. Plus, with my teal thermal shirt and magenta skirt, I’m the picture of thru-hiker fashion (and it matches my Altras)! I took this skirt out in the rain and it did fine. My phone stayed dry in my pocket and the DWR coating kept the skirt from getting totally saturated. However, the skirt did take a little longer to dry than the rest of my layers, and all thru-hikers know from experience that DWR fades over time, and enough rain will saturate anything. If I were to take this skirt out on a long-distance hike, I’d make sure to have either a rain skirt or switch to rain pants for heavy sustained rains. This is a great skirt. It’s comfortable, warm, and cute. While I think it works best for day hikes and short backpacking trips with cooler weather, I’d also take it on a shoulder-season thru-hike on a trail like the Arizona Trail (not too wet). While the skirt was comfortable in the 30s F, if it got much colder I’d need something warmer. 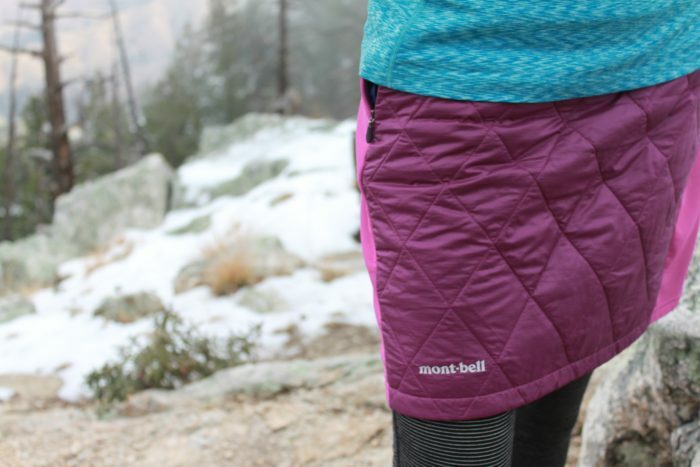 I think the skirt performs best with temps in the 30s and 40s F. At $55, it’s a little pricey, but I know from experience that Montbell products are made well enough to last multiple thru-hikes, so you’ll definitely get your money’s worth.